Time is a precious commodity when you are trying to balance work, life and family, making it all the more important to select the right school to continue your lifelong learning goals. With so many continuing education options out there, how does one decide which program is best for them? This is a question that we keep in mind at all times. It is what guides our staff during the development process, creation of marketing initiatives, training of customer service, and every other facet of the CE organization. We anticipate what is best for our students based on feedback from class evaluations, advisory board members, partner organizations, market trends, and community demand. These make up the foundation for what all of our programs, certificates, and classes are built upon. The classes and programs at Bellevue College CE offer a diverse selection of offerings for every learner from teens and professionals to active seniors and artists. North Campus is conveniently located in the technology hub of Bellevue right off of the 520 freeway making it easy to take classes after work. The non-credit, non-cohort model offers students increased flexibility to take classes across multiple disciplines at a pace that best fits their individual schedules and lives. As a student of Bellevue College Continuing Education, you have access to Bellevue College Main Campus resources that can enhance your overall experience. Some of these resources include the Center for Career Connections, Gymnasium, Business Center, Computer Lab, and much more. As part of the Bellevue College family, the North Campus location benefits from the longstanding BC reputation for putting students first and serving the community to support the educational goals of all Puget Sound residents. We are a PMI Registered Education Provider, our courses count toward the 35 hour PMP (Project Management Professional) education requirements or the 23 hour CAPM (Certified Associate of Project Management) education requirement. 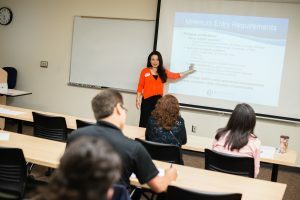 The Translation and Interpretation Certificate Program is one of the few credit certificate programs of its kind in the U.S.
Daytime, evening, and weekend classes offered. Largest selection of non-credit language classes in the State. Professional Certificates for career advancement without having to complete and pay for 2 or 4-year degrees. State required licensing classes for Real Estate and mandatory healthcare HIV/AIDS training. Customized corporate training from the Business Training Institute for enhanced business and employee performance. No admissions required = easy registration. Search for classes and register online! Fun and relaxing learning options – Ex. Calligraphy or Drawing and Painting classes. Full customer service team including a front desk and call center to serve the needs of all students. Ready to get started with your own Bellevue College Continuing Education experience? Browse current classes in the printed catalog and online. Have questions? Call our Customer Service team at (425) 564-2263 Monday-Friday from 8:00am to 5:00pm. We look forward to seeing around North Campus!